Apple is once again under scrutiny for its product warranty practices overseas, as a consumer watchdog group in Australia has forced the company to change its refund and return policies to be in line with the country's laws. According to the Australian Competition and Consumer Commission (ACCC), Apple has been misleading customers about its responsibility to return, replace or refund purchases of product found to be faulty, reports The Sydney Morning Herald. "The ACCC was concerned that Apple was applying its own warranties and refund policies effectively to the exclusion of the consumer guarantees contained in the Australian Consumer Law," said ACCC chairman Rod Sims. "This undertaking serves as an important reminder to businesses that while voluntary or express warranties can provide services in addition to the consumer guarantee rights of the ACL, they cannot replace or remove those ACL guarantee rights." In an investigation detailed on its website, the ACCC found Apple was applying its usual 14-day return policy and 12-month standard warranty to items sold in its physical and online stores. In addition, Apple employees were directing customers with malfunctioning or faulty non-Apple products to the original manufacturer. Customer rights under the Australian Consumer Law, which went into effect in 2011, provides guarantees against faulty products for what is described as a reasonable amount of time based on cost and quality of the item. As such, the guarantees have no set time limit, Sims said. The ACCC would be able to take Apple to court over the findings, but the company has agreed to an undertaking that calls for a revision of its policies in the region, as well as the retraining of staff to provide proper guidance regarding product warranties. In this case, Apple will institute warranties and return policies that extend up to 24 months after date of purchase and the company acknowledged that some products may be covered beyond that period. Apple will also conduct its own investigation into faulty product claims going back two years starting from Jan. 6, the official date of promised policy change. Over the next 90 days, the company will review returns and seek to remedy any failings as mandated by the ACL. 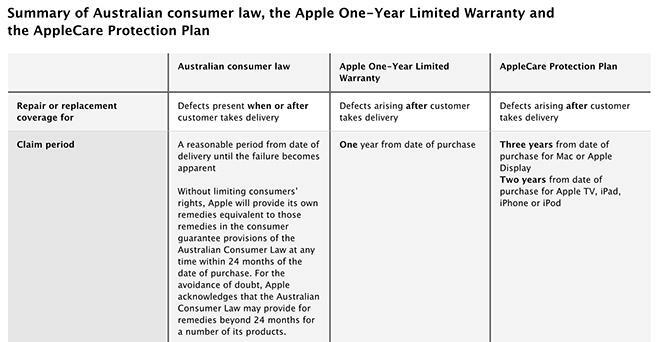 Finally, Apple will keep a consumer rights information page on its Australian website for a period of two years and keep ACCC consumer rights brochures handy at its brick-and-mortar Apple Stores. Adding another layer to the issue, Apple had already extended its Australian AppleCare hardware guarantee to two years as of March this year, to bring the terms up to government standards. It was reported at the time that an internal email instructed employees not to discuss the changes with customers, a practice that may have contributed to the ACCC's findings. Internationally, warranty issues have been an ongoing struggle for Apple. In 2012, the company was fined over $260,000 by the Italian government for offering customers two-year AppleCare warranties rather than the standard free one-year option. Local law requires two years of free protection. The same situation occurred in 2011, when Apple was fined $1.2 million over similar "unfair commercial practices." 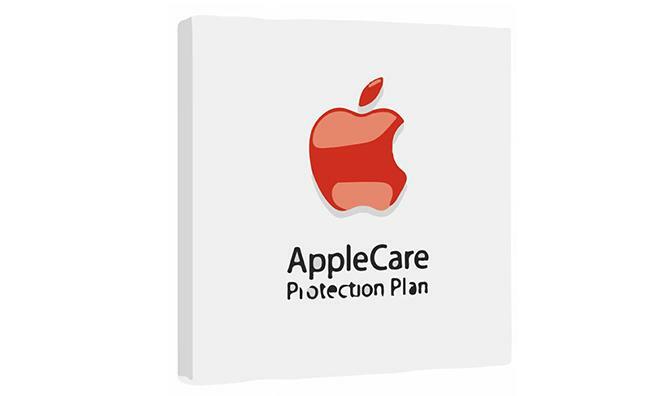 Earlier this year, Apple was hit with a complaint from a non-profit consumer advocacy group in Belgium for improperly marketing AppleCare warranties.